Frank Conroy first visited Nantucket with a gang of college friends in 1955. They came on a whim, and for Conroy it was the beginning of a lifelong love affair with this "small, relaxed oasis in the ocean." This book, part travel diary, part memoir, is a hauntingly evocative and personal journey through Nantucket: its sweeping dunes, rugged moors, remote beaches, secret fishing spots, and hidden forests and cranberry bogs. Admirers of Conroy's classic and acclaimed memoir Stop-Time will again delight in what James Atlas, writing in The New York Times, called his "genius for close observation." 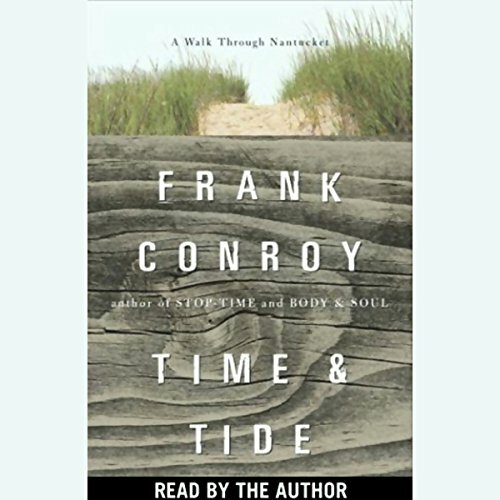 In Time and Tide, Conroy recounts the island's history from the glory days of the whaling boom to the present, when tourism dominates. He vividly evokes the clash of cultures between the working class and the super-rich, with the fragile ecology of the island always in the balance. But most fascinating of all, he tells his own story: of playing jazz piano in the island's bars; of raising a barn in the early '60s with the help of a bunch of hippie carpenters; of leasing an old, failed bar with two island pals and turning it into the Roadhouse, a club "that was to be ours, the year-rounders, and to hell with the summer people." There's a marvelous story of his first golf game, played on an ancient nine-hole course with two friends, a part-time sommelier and a builder from the South who invented the one-handed pepper mill. ©2004 Frank Conroy (P)2004 Random House, Inc., Random House Audio, a division of Random House, Inc.
Bring back, 'Body & Soul'! I still revere that book to be one of my all-time favorites... 1993. Some chose it as book of the year back then. The history of Nantucket from the author's timeline, and the perspective of the island from a person who loves the island and has lived there year round for many years. As my family has just discovered our ancestors to date back to two of the original 9 families who purchased Nantucket Island, I am devouring everything I can find on the history of Nantucket. Thank you Mr. Conroy for sharing this wonderful island of Nantucket with the rest of us less fortunate, as to not have been able to live in such a historic and interesting place.